It is difficult for Elaine to adjust to the life of a servant, but her main challenge is that Miss Pettifor and the head servants are clearly out to get her. Mary helps her to get used to the tasks but Elaine is firstly nearly suffocated when Mrs Rutherford lights a fire underneath her after sending her up the chimney, and then is thrown down the well by a mystery assailant. Mary helps Elaine to climb out but of course Mrs Rutherford comes out almost immediately and sees that her ploy has failed. She tells Elaine to climb back down the well to find the bucket, and of course she is terrified at the thought – and says that Mary was the one who knocked it in, and Mary has to climb down instead. Mary understands that it was fear that drove Elaine to say that, but that forgiveness means little when Mary gets very ill as a result of her ducking. Elaine sticks up for Mary and helps to nurse her during her illness, so the other servants think better of her after all. Miss Pettifor is still out to kill her if possible, though – her next attempt is to run her over with a horse and cart. Some of her fellow servants stick up for her, but in retaliation Mary is once more driven to illness by Miss Pettifor and Mrs Rutherford. When Elaine spots her uncle coming to visit, she thinks that he will be her way out, and escapes to find him. 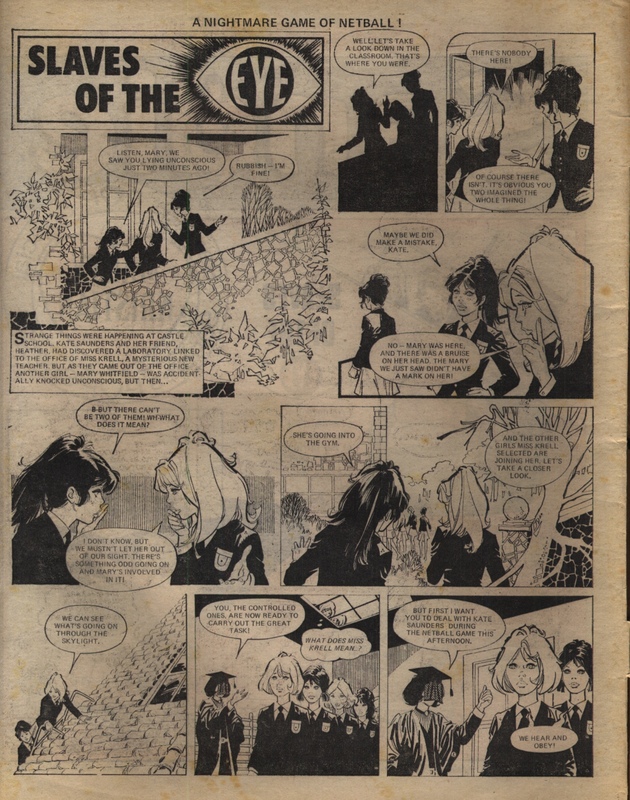 However, a panel set back at Miss Pettifor’s Academy has the uncle explaining that it was he who set up the series of murderous attacks, because ‘with her out of the way, I am the sole heir to her dead father’s fortune’. Elaine has escaped from the Academy, along with Mary, but her erstwhile friends don’t believe that the tattered escapee is really Lady Elaine Moresby, who they have been told has ‘been dead these past three weeks!” And when she reaches her old home of Moresby Hall, her uncle shoots at them, sets the servants on them claiming they are ‘gipsy thieves’, and makes Miss Pettifor and Mrs Rutherford go after them to fetch them back to the academy. Not content with that, her uncle has the school set on fire, with the two girls trapped inside! So it is all a real giveaway that they have serious enemies who will stop at nothing. They manage to make it back to Moresby Hall, where Elaine finds some papers written by her father’s lawyer, Mr Murchison. Her father wasn’t penniless at all, and her uncle is claiming the estate as his. They try to see Murchison to plead Elaine’s case, but he is ill and they aren’t allowed in – and when they are taken up by the Bow Street Runners, Uncle Ned tells the magistrates that Elaine ‘suffers from the delusion that she is my niece Elaine’. He also threatens her friend Mary. 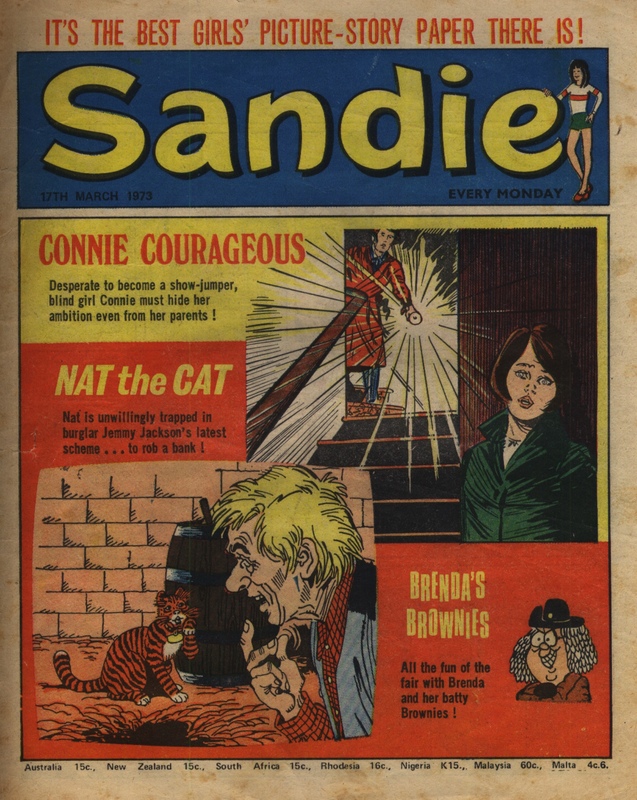 Defeated, Elaine can only plead guilty to imposture – and Uncle Ned, now clearly revealed as a black-hearted villain, sends her to a dreadful quarry where kids are made to work until they drop. However, a death from overwork isn’t going to be quick enough for Uncle Ned – firstly because Mary is making a nuisance of herself, asking questions (so off to the quarry she goes, too), and then because the father’s ship turns out to have survivors after all. So the head man in charge of the quarry is enticed into locking the two girls in a burning shed full of gunpowder… Miraculously, they escape once again, and this time are taken in by a shepherd who recognises Lady Elaine for who she is. Biddy, Elaine’s old nurse, also knows who she is, but the real test is whether Lawyer Murchison will do so or not. He is nearly convinced, until Uncle Ned shows him Elaine’s hands, coarsened by weeks of work. It was all for nothing, and Elaine is tried and sentences to be transported for life. Mary proves her worth once again as a true friend, though- she forces her way into the place where Uncle Ned and Miss Pettifor are bamboozling the father with spurious stories of Elaine’s last days before succumbing to pneumonia. 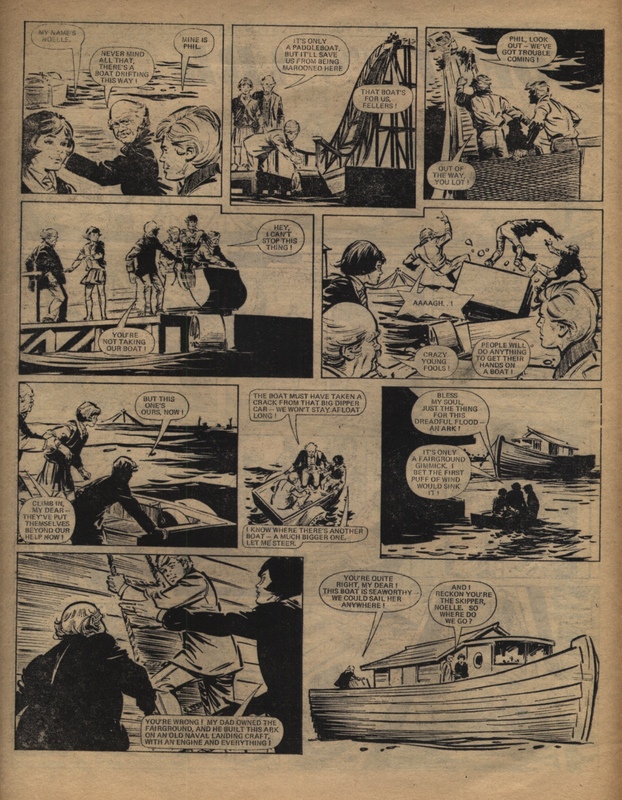 All’s well that ends well as her father turns up at the transportation ship to rescue Elaine just as she is trying one last escape – this time by plunging into the water to swim away. 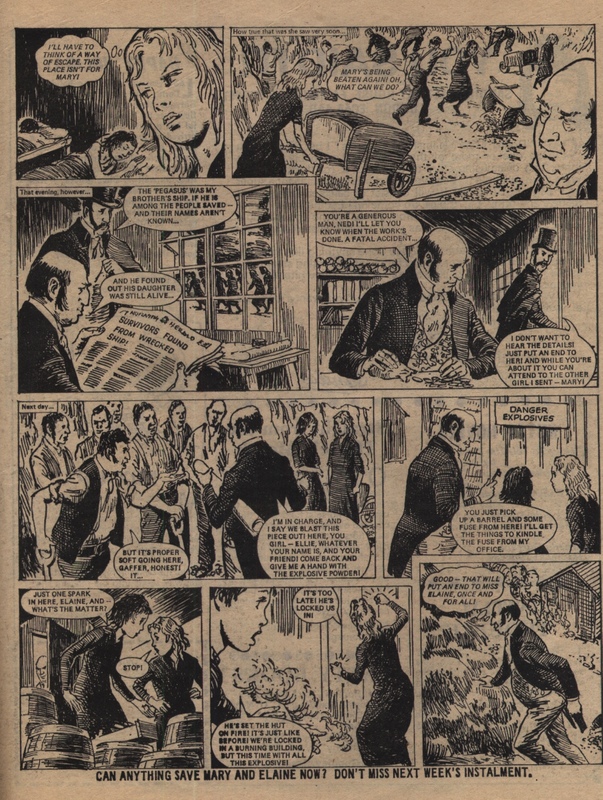 The last half page shows the faithful companion Mary and the reformed character Elaine drinking tea at Moresby Hall, and planning to enrich the lives of these who have less than she does. “Little Lady Nobody” is a slave story with strong redemption narrative elements. It is as over-the-top as most slave stories tend to be – of course the protagonist faces hard work, lack of food, and lack of sleep, but matters quickly escalate from the hard life of a normal skivvy to multiple threats of violent death. This cruelty is the main focus of the story, though Lady Elaine’s transformation from spoiled uncaring rich girl to compassionate champion of the poor is also a thread running through the first few episodes or so. Elaine is quite a sympathetic character as she is very determined and tries very hard not to be beaten. Of course she is not perfect – as well as having to learn how hard a servant’s life is, she is also understandably affected by the various frights she’s had, and it leads her to some disgraceful actions that she is ashamed of later. For instance in an early episode she lies and says that it was Mary who dropped the bucket down the well, though of course it was Elaine herself who did so, because she was being pushed down the well by an unseen hand. But her lie is because she is so scared, she can’t face climbing down the well to retrieve the bucket as the cruel slavedrivers demand, so although it is wrong of her, we understand that this is not a real relapse into being an uncaring rich girl. Even after asking David Roach and others on Facebook, it is not clear to me who the artist is. Catawiki credits this story to Desmond Walduck. 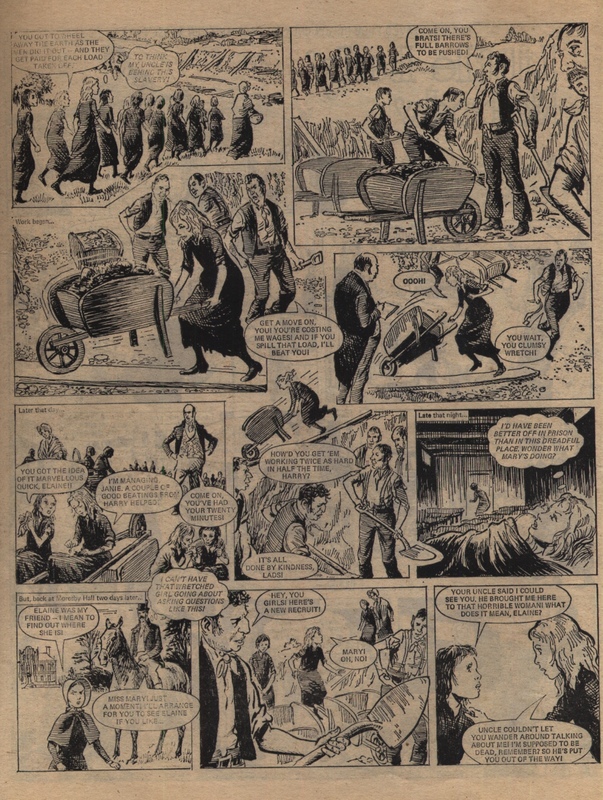 who drew “Slaves of ‘War Orphan Farm'”, and there is certainly a lot of similarities. 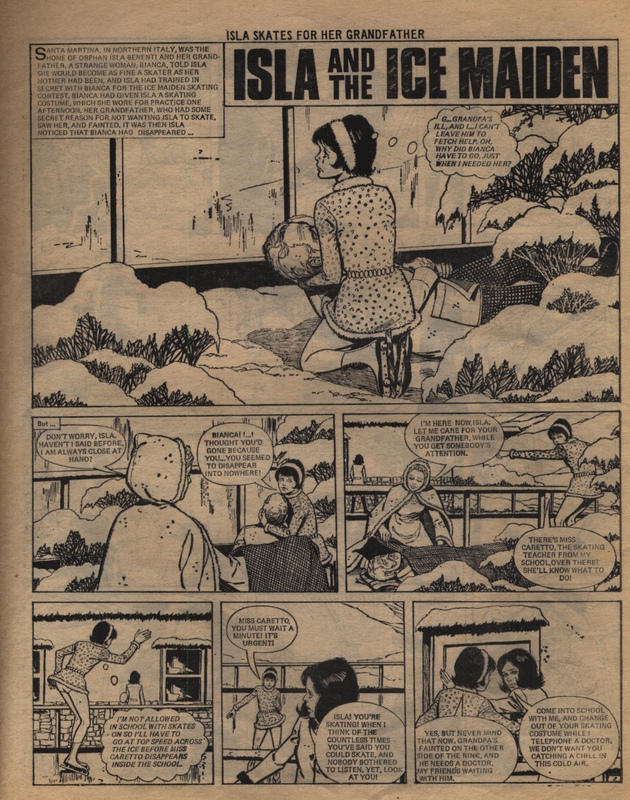 However, the later Sandie story “Sisters in Sorrow”, drawn by the same artist and with a very similar theme, was previously identified by David Roach as being by a female artist called Broderick. 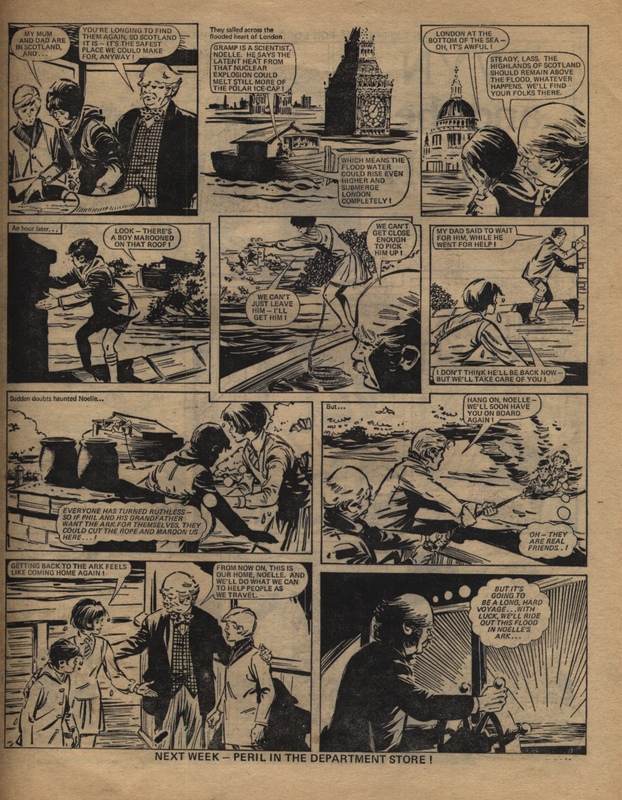 And when I looked at this story, my immediate feeling was that it looked like the work of Roy Newby, who is credited with drawing “Slaves of the Candle” and “Bound for Botany Bay” in Jinty, and “Nina Nimble Fingers” in Lindy. 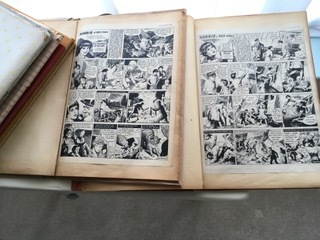 All three of these were historical stories set in the 18th and 19th centuries, featuring slavery, severe injustice, hard times, and danger of death – so again very thematically similar to the current story under discussion. However, on further consideration, I think I will withdraw that identification. 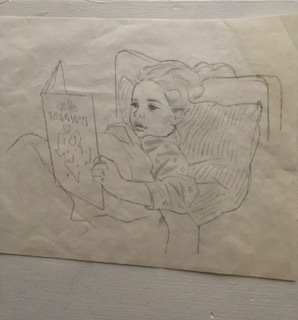 Roy Newby’s work is much smoother than the rather scratchy line used by the artist on “Little Lady Nobody” and the figure drawing and the faces are not quite the same either, though there are a lot of similarities in elements like noses and chins. Roy Newby’s children also do not think that this is by their father, though they again can see the similarities. Perhaps we will find that there are three artists with very similar styles – Newby, Walduck, and Broderick. 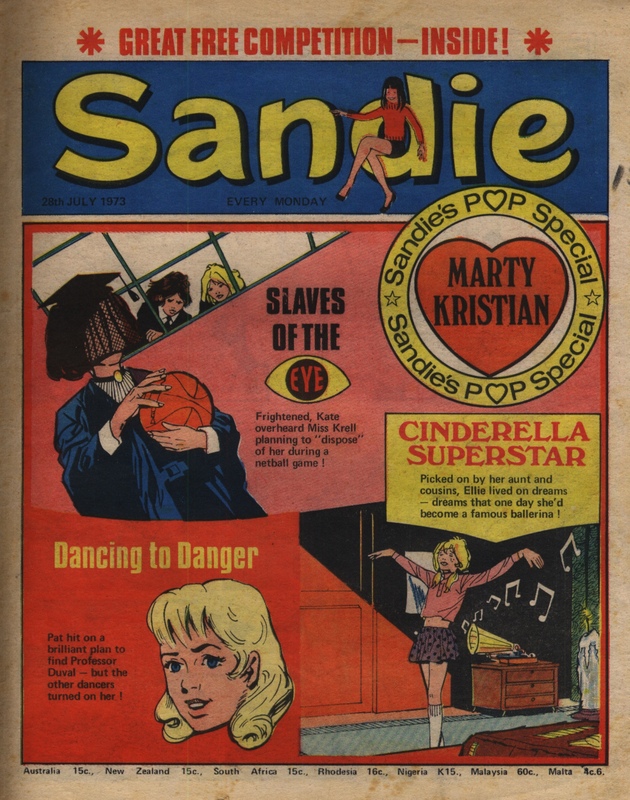 As I have been lucky enough to get a run of 69 issues of Sandie, and am now posting about each issue in consecutive order, it seemed sensible to tweak some of the elements of the blog to reflect the wider range of titles included. 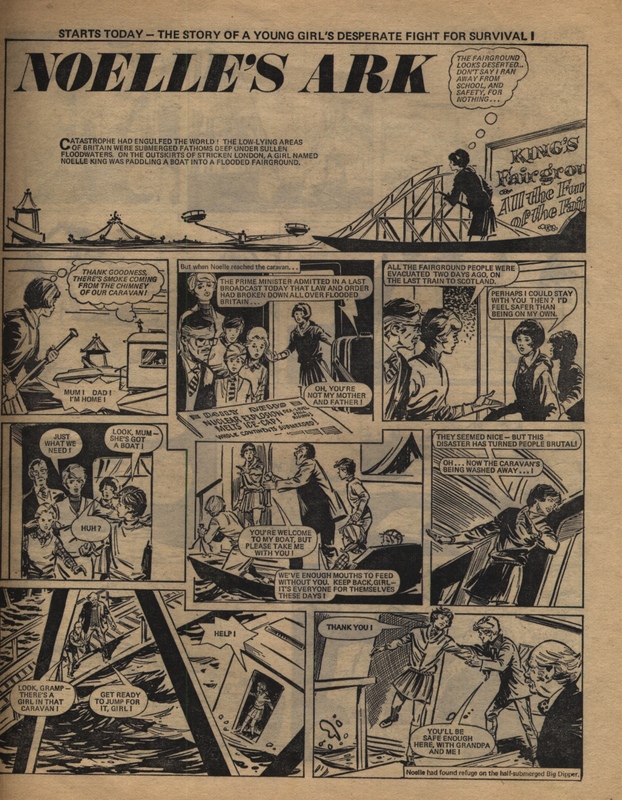 The page that previously was just called ‘Issues’, which listed all the issues of Jinty which we’d posted about, is now called Indices of issues and annuals. The aim is to mention the key titles covered on this blog, with a link to the separate page where the index of each title is held. 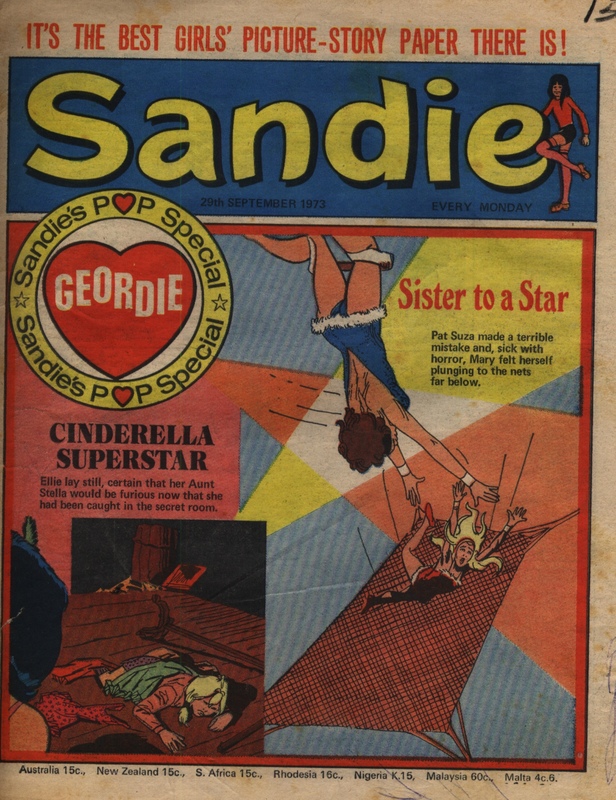 I’ve also updated the posts on the first three Sandie issues to list a couple of additonal artist credits. 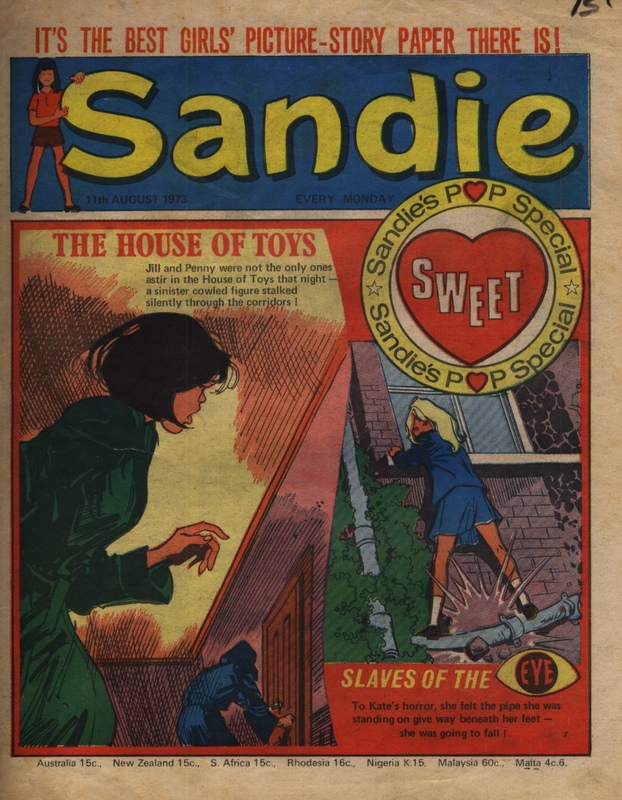 I checked on Catawiki and I see that Sleuth on that site has credited “Wee Sue” to the artist Vicente Torregrosa Manrique, and “Bonnie’s Butler” to artist Julio Bosch. 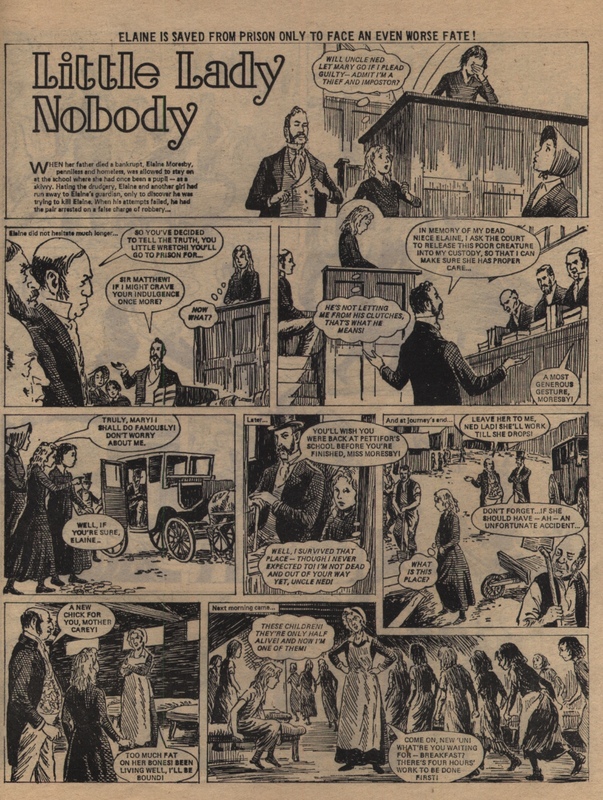 She also credited “Little Lady Nobody” to Desmond Walduck (artist on “Slaves of War Orphan Farm”) but I feel like the art is a better match to Roy Newby, per my original credit. Anyone have an opinion on this? I will post some scans later on to help with this identification, if need be. Edited to add: I now think this is not a match with Roy Newby’s work and am taking back this identification.